The iconic food of a certain destination, the thing that you should absolutely try is not necessarily always something up to your taste. Like curry wurst in Berlin or pasteis de nata in Lisbon – they are not on my “top 100 foods” list just because everyone else likes them (or so it seems, perhaps they just pretend). But you can’t know whether you like something or not until you try it. So in New Orleans we did just that – followed the crowd and recommendations and here’s my take on the traditional foods of the crescent city. Sandwiches are not really my thing. I’m not a big fan of salami or any of it’s many variations, neither do I like mayo which usually comes into a sandwich one way or another. I love cheese though, but why eat it with so much bread is beyond me. 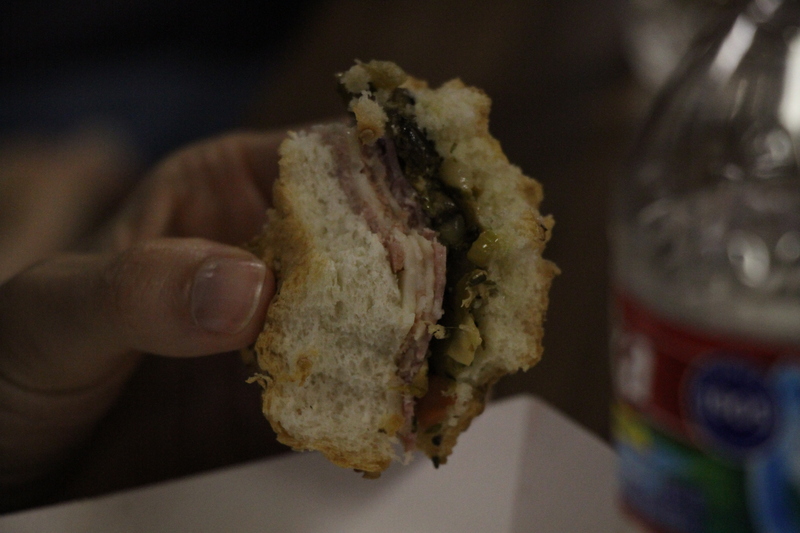 But my first bite at a muffuletta at Serio’s Po-Boys and Deli took me completely by surprise. “Wow this is tasty!” screamed my tastebuds just seconds after my eyes told me that this is just another sandwich consisting of thick layers of salami, mortadella AND ham and just a couple of thinly cut slices of provolone cheese. But it is the mixture of crushed olives, capers and peppers soaked in olive oil that turns this sandwich into a gourmet dish (if you turn a blind eye at its less than Top-Chef-style presentation). I am sure there are as many muffuletta variations as there are delis in New Orleans and trying to find the best one is like asking a Belgian which is their best beer. I would however bet that if a business and with it its original muffuletta recipe has been passed on for generations like at Serio’s you can’t really go wrong. 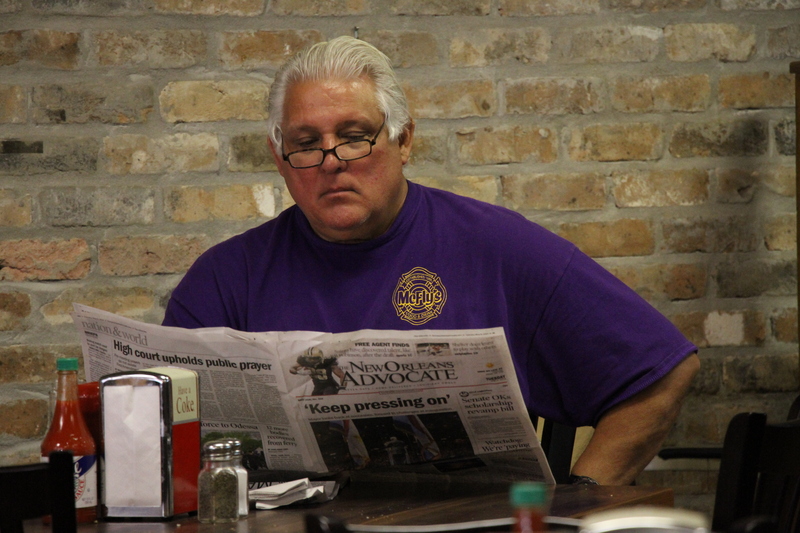 And if the business owner is reading the local newspaper at one of the tables – well, that’s what I call efficient quality control. If muffuletta was invented so it could survive the hot and humid New Orleans climate and still be safely consumed hours after it was made, po-boys are a totally different affair. This sandwich made of French bread, filled with any imaginable kind of filling – from traditional fried shrimps or roast beef to more creative combinations like smoked salmon and melted brie topped with fried eggs should be savoured immediately. And while doing this be sure to have enough napkins at hand, because if you’re not a po-boy-eating pro one of the two things is bound to happen: either your will squeeze your filling out of it with your first bite (believe me, I know what I’m talking about), or the gravy will drip all the way down to your elbows. A wholly dressed po-boy comes with lettuce, tomato, pickles and mayonnaise as well as gravy so there is really no elegant way of eating it. 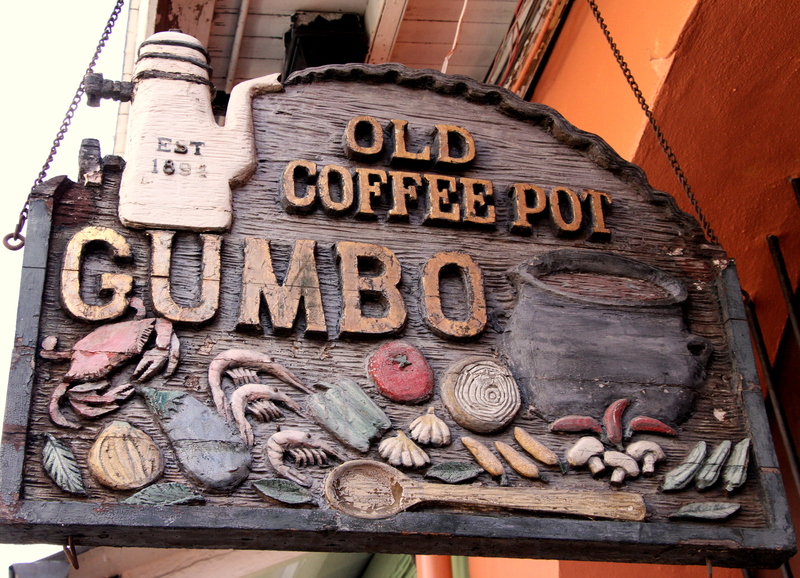 Like all traditional NOLA food po-boys also boast an interesting history. Originally, they were served to local streetcar operators while they were on strike in 1929. Two of their former colleagues decided to help their friends in need by offering them sandwiches free of charge. But I doubt the first “poor boy” sandwiches were as filling and tasty as they are today. By the way, we had ours at Johnny’s Po-Boys which is the oldest family owned po-boy restaurant in New Orleans and was also the first to open after Katrina, at least so we were told. 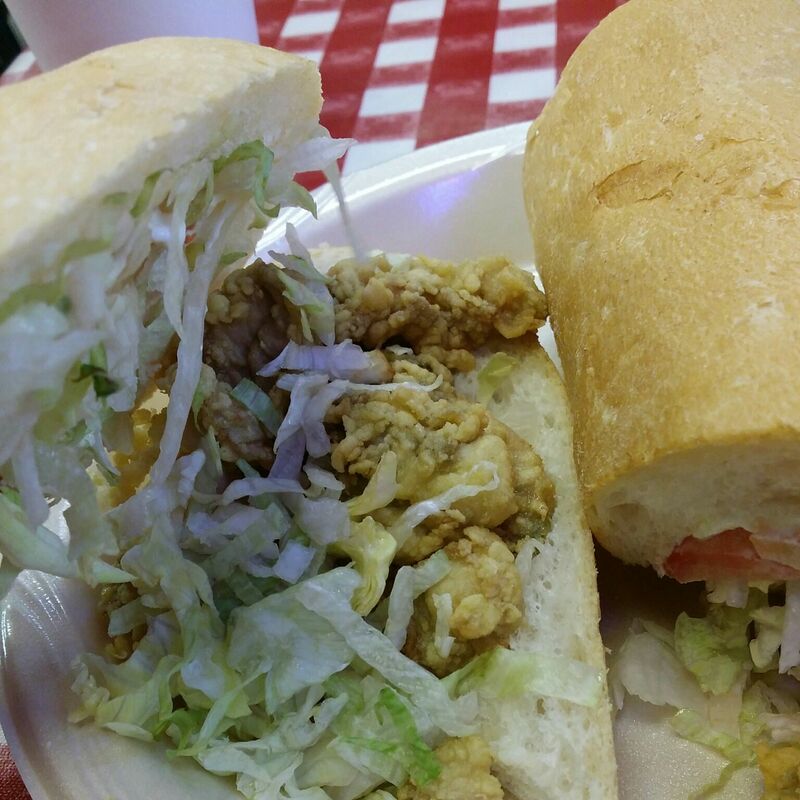 Oyster po-boy for breakfast – why not? I won’t lose much time on beignets and cafe au lait. Not to say that I don’t like them but they are nothing really special. 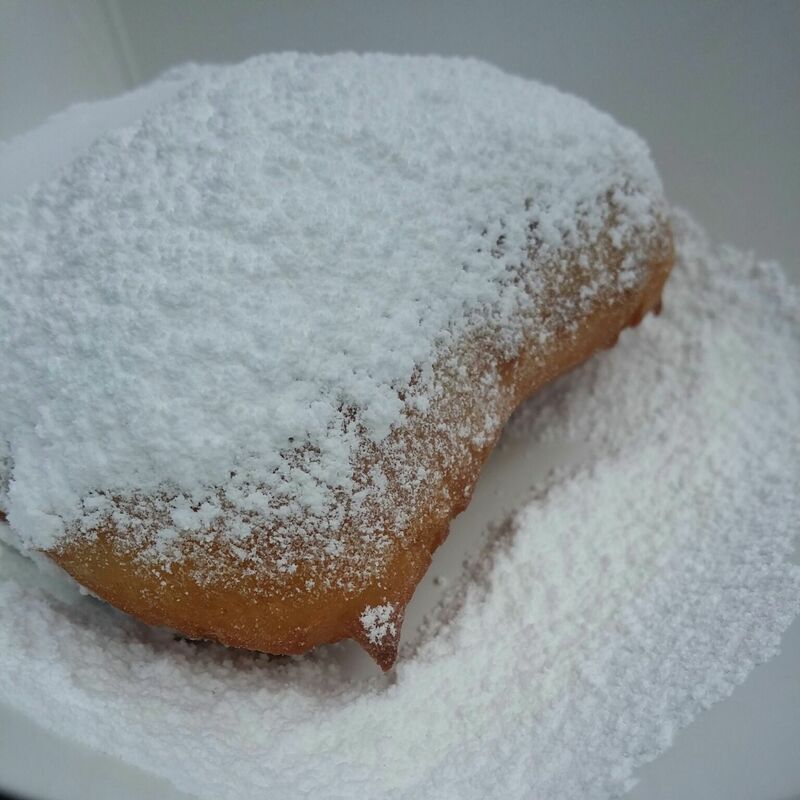 Fried dough cowered with thick layer of powder sugar tastes very similar to our “flancati”. Surprisingly, coffee with chicory tastes good even to an average central European who only considers Italian coffee worthy of drinking. What’s astonishing about beignets is the Cafe du Monde where everyone, and I mean literally EVERYONE, goes to taste them. The place is crowded and noisy at all times and when you walk past the kitchen into the restroom it makes you reconsider the decision of ordering anything here. The almost exclusively Asian (?) waiting staff is pouring coffee out of big aluminum containers and arranging beignets onto plates and trays and the whole place is humming like a factory. A money factory. If nothing else, the place is great for people watching. No, I won’t write about the sweet Creole candy originally made of sugar, butter and pecan nuts and its numerous modern variations. Much more fascinating is the unusual combination called praline bacon. Yes, you read it correctly – it’s sugar coated bacon. To paraphrase the unforgettable words of Joey from Friends: “Sugar – goood. Bacon – goood. What’s there not to like?” I never thought I would say this, but in this case I have to agree. 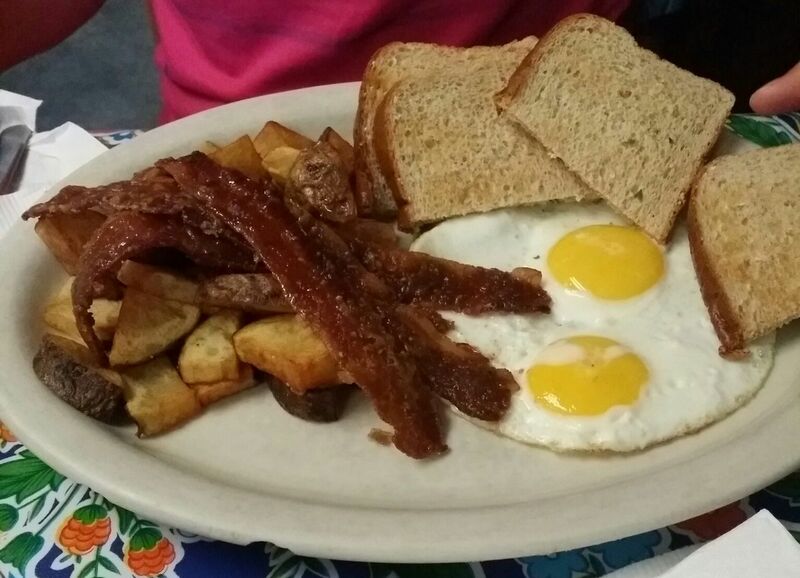 We had our fix of praline bacon at the Elizabeth’s Restaurant where it was supposedly invented. I admit that I didn’t really put much attention into what I ordered so I expected normal bacon. It certainly looked like that on the plate, perhaps just a little bit more crunchy. But once I put the first piece into my mouth it was like nothing I’ve ever tasted before. The combination is so unexpected that it strangely works and the bacon just melts in your mouth. But it’s also so intense that I could hardly have more than three pieces which we shared between the two of us. Along with the eggs, toast and potatoes it kept me going until the evening which rarely happens. And then there’s gumbo which is a thick and strongly seasoned stew served over rice. Funny thing about this filling dish is that you can get it in cheap eateries as well as in the best upscale restaurants. It may be prepared following some old grandma recipe or with a twist of a big shot chef like Emeril Lagasse. We tasted three different gumbos and covered the whole price range. I would like to say that I loved them, but unfortunatelly, I can’t. One of the main ingredients of gumbo is also celery and this is the only vegetable that I absolutely can’t stand. So sorry, gumbo, it’s not you, it’s me. But if you like celery, go to the Old Coffeepot Restaurant. The executive sous chef was describing the recipe and preparation of their traditional gumbo with so much passion that I was almost disappointed with myself for not absolutely loving it. Is It the Bug Or Just Post-NOLA Blues? A couple of points. I guess you don’t much like our food. Oh well. But, here’s some stuff to know. ALWAYS wear black when you go to Cafe du Monde. Heh, heh. The base ingredient to gumbo isn’t just celery. It’s the trinity — onions, celery and bell peppers. But, the real key is in the roux. If that wasn’t made properly, the gumbo suffers. Oh, the other thing to remember is to get out of the Quarter. Nobody there ever tells the truth. And, the food isn’t all that great. That’s better. 🙂 So write about it. Then I can pick on that too. Hahahahahahah. Where di you eat on your second trip? Sorry. I have this thing about tourist food which aside from a couple of newer and very old restaurants is about all you get in the Quarter. We go to the Quarter no more than twice a year whether we need to or not. One time is usually for Caroling at Jackson Square and a Revellion dinner. (Creole Christmas food). Commander’s is a couple a blocks away from us. It’s on our dogs’ walking route. On Thursday nights, the kitchen staff comes out and gives them big bones. Trust me. The dogs can’t read a calendar but they know about Thursday. Sundays, for me, are always about second line parades. I usually eat on the parade route. Nothing like home cooked soul food. Cool. Did you like it? What did you think of the neighborhood? This time we planned our stay so that we could see a second line and were lucky enough to catch two on that weekend. I felt I didn’t belong there with my camera, but nobody really seemed to mind. I loved the relaxed atmosphere and was that much more shocked hearing about the shooting last Sunday 😦 I felt perfectly safe and was just thinking about how prejudiced we sometimes are about other people and their customs. For me it was a great experience. The Saturday second line was a make up parade. It had gotten rained out twice. Weather is the only reason the city allows the permit fees to be transferred to another day at the last minute. Permits are expensive. For a parade that size permits cost around $5000. If you go back through my second line pictures over the years on Storyteller you’ll see some pictures that are just a wall of cameras. Nobody cares if you take pictures. The Indians care if you sell pictures of them fully masked and suited without splitting some of the profits with them. But, they don’t come out in big public displays more than three times a year. That particular neighborhood in Central City has calmed down in the last couple of years… The mass shooting in the 9th Ward last Sunday had little or nothing to do with the second line. That was mostly about two rival gangs having a gun fight. But, that’s the thing. New Orleans has historically been a very rough and violent city.